If you are a fan of electronic dance music, then you must have come across songs by Sofi Tukker. However, if you are not, then introductions are in order. Sofi Tukker is an American music duo; they have mesmerized audiences around the world with their brand of dance music. It comprises of two members, Sophie Hawley-Weld and Tucker Halpern, and they are based in New York. Sophie and Tucker have churned out several hit singles such as Drinkee, Best Friend, and have received two Grammy nominations. Additionally, their song Best Friend was the official soundtrack at the launch of Apple’s iPhone X. This helped in no small measure in propelling them to fame. Want to know more about this musical group and the members? Then you are in the right place. Sofi Tukker’s existence was anything but planned. A fact that may be hard to understand given the measure of success they have achieved. The group was formed in 2015. At the time, the two individuals who make it up were seniors at Brown University. Sophie Hawley-Weld was a member of an acoustic bossa-nova jazz trio billed to perform at an art gallery show. On the other hand, Tucker Halpern was the show’s DJ for the night. Halpern found the group’s songs beautiful but slow. As such, he decided to remix it by livening it up a bit. Hawley-Weld loved the results of his remix and they both decided to start collaborating musically. They got together and a few months later, released their first single, Drinkee. Drinkee was a smash hit and made the charts in the U.S., Italy, and Turkey. The duo did not rest on their oars but instead got to work and released their first EP the next year, 2016. The EP was titled Soft Animals and featured tracks such as Drinkee, Matadora, Awoo, Déjà Vu Affair, Moon Tattoo, Hey Lion, etc. The EP was a success as it reached 14 on Billboard’s dance/electronic albums chart. 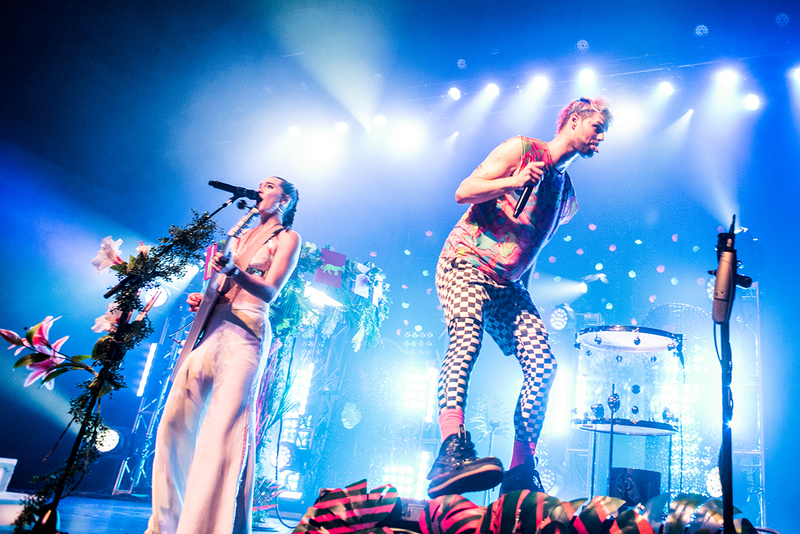 Sofi Tukker continued their impressive rise in 2017 and 2018. In 2017, they released their widely popular single, Best Friend. The song featured artists such as Nervo, The Knocks, and Alisa Uemo (a Japanese vocalist) and topped the charts in the U.S., Belgium, and Holland. Sofi Tukker has not been distracted by their success. Rather, they have remained focused on their work. They released their debut album in April 2018. Titled Treehouse, the album features tracks such as Baby I’m a Queen, Energia, Batshit, That’s It (I’m Crazy), etc. 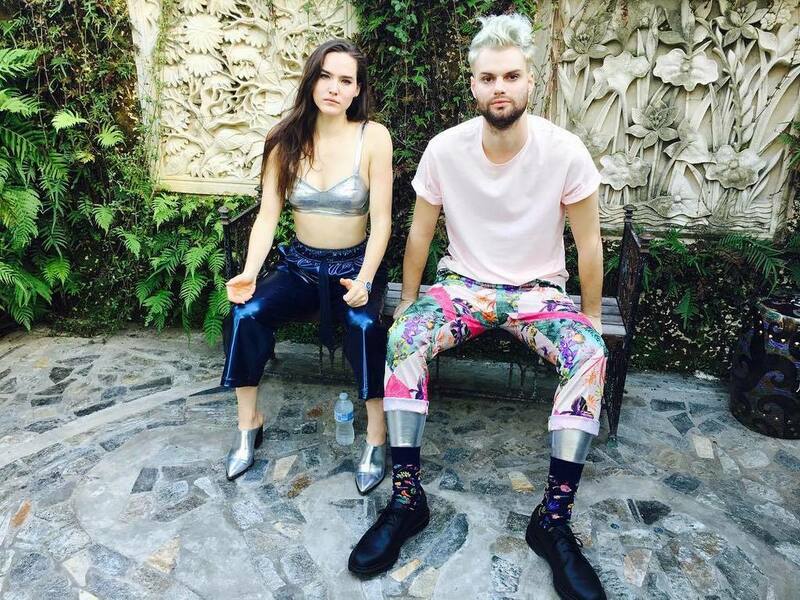 Sofi Tukker comprises of two members namely Tucker Halpern and Sophie Hawley-Weld. Physically, these two differ. While Halpern is tall, lanky with blonde hair, Hawley-weld is not as tall and has blue eyes and brown hair. Despite their physical differences, they both share a mutual love for music. Tucker Halpern grew up in Boston and fell in love with music as a child – Thanks to the disco tracks he listened to in his parent’s car. He also loved basketball and excelled at it. As such, he focused on it throughout high school and his junior year of college. He had his high school education at Noble and Greenough, one of the most expensive and elite private schools in America. Halpern dedicated his life to basketball and even hoped to go pro. However, in his junior year of college, he contracted a serious illness (Epstein-Barr Syndrome) which left him bedridden for 8 months. Rather than wallowing in self-pity, he taught himself how to produce music using his computer. This revived his love for music and upon recovery, he started taking music classes in college. He also Deejayed at various clubs and parties across campus. It was during one of his DJ sets that he met future partner, Sophie Hawley-Weld. Sophie Hawley-Weld has a more international background. She was born in Germany and spent her formative years in a rural part of Canada. She had her high school education at an international high school in Italy. Hawley-Weld equally fell in love with music at a young age. As a child, she loved singing and dancing and penned her first song while in the 6th grade. Despite this, she didn’t consider music as a viable career part. She studied Portuguese poetry while at Brown University. 1. The duo has two Grammy nominations to their credit. Their very first song, Drinkee, was nominated for best dance recording at the 2017 Grammys. The award eventually went to Don’t Let Me Down by The Chainsmokers. Their debut album, Treehouse, was equally nominated for best dance/electronic album at the 2019 Grammys. 2. Three of their songs have been used in different Apple Ads. Their single, Drinkee, was featured in a 2015 Ad for Apple Watch. In 2017, their smash hit, Best Friend, was featured in the unveiling of iPhone X. Similarly, in 2018, their song That’s it (I’M Crazy) was featured in the Ad for iPhone 8 red smartphone. It must be noted that all this is not for free. The duo has earned a handsome amount for the use of their songs by Apple. 3. The duo does not like to be boxed into a specific genre. Their music cuts across several genres such as house music, techno, punk, and rock. 4. Their music has been featured in two editions of FIFA video games. Their song Johny was featured in the soundtrack for FIFA 17 while Best Friend was featured in the soundtrack for FIFA 18. 5. The duo has drawn musical inspiration from the works of several Brazilian poets. This is probably due to Sophie’s love for Portuguese Poetry. Their first single Drinkee was based on a poem by Brazilian poet, Chacal. Another single, Johny, is based on the work of Brazilian poet Leminski. 6. Even though one may be tempted to jump to such conclusion, the duo is not a couple. In fact, according to them, they have a strict no-touching policy.